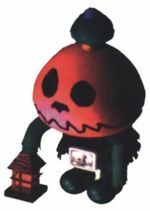 Straw Heads are scarecrow or zombie like enemies encountered on the Sunken Ship in Super Mario RPG: Legend of the Seven Stars. Straw Heads are extremely rare to find. They are also surprisingly weak despite their rarity, but can still be an annoyance with their Stench attack which poisons and S'crow Funk which can turn Mario or any member of his party into a Scarecrow. Straw Heads resemble an earlier enemy Mario and Mallow encountered in Kero Sewers named Hobgoblin. Despite resembling scarecrows, Straw Heads are surprisingly resistant to fire. This page was last edited on November 3, 2017, at 01:16.